The following cheats are available for Call of Duty: World At War, the fifth video game in the Call of Duty first-person shooter video game series on the PC. First, enable the console from the in-game options menu. Otherwise, you will not be able to bring up the console where you need to enter the codes. Then, press the tilde key ( ~ ) to display the console window and type 'devmap ***' to enable cheat mode. Replace *** with the map code that you are currently on. For example, if you are on the Hard Landing level you would type 'devmap pel2'. A full list of map codes is listed below. You can also see the name of the current map by opening the console and typing 'map', then pressing enter. Now you're ready to cheat on Call of Duty: World at War! Enter one of the following codes at the console window to activate the corresponding cheat. Note: Map level codes are listed below. Use these codes with the devmap cheat code listed above. In order to prevent enemies from throwing back your grenades, you should 'cook' them before tossing them. This is done by holding down the Grenade button for a few seconds (just a few!) before tossing it. Don't hold onto a live grenade too long or it'll blow up in your hand! Cooking is obviously not recommended when you're throwing back an enemy grenade. Secret Death Cards can be found in certain levels in the game. Death Cards can be used in co-op mode to create special 'cheat' effects that add different twists to the game. Look for Death Cards on helmets propped up by rifles stuck in the ground (like makeshift graves). Not sure what to do next? When you hear the name "Miller" or "Demitri" that's you, soldier! Roebuck or Sullivan will sometimes instruct you to cover fire, throw a smoke grenade, etc. - so pay attention! Zombie Mode - Natch der Untoten! For a little fun Call of Duty: World at War includes a mini-game as an unlockable bonus if you complete the Solo Campaign. Start with a pistol and work your way up, as you scramble to defend your cabin from a post-war zombie invasion! Earn points to purchase weapons, upgrades, cabin space and more. With each round the zombies become faster and more aggressive, increasing the sense of panic as you try to survive as the last human standing! Featuring arcade-style pickups, bonuses, and scoring system, "Natch der Untoten" is actually a game within a game that involves plenty of strategy and skill. 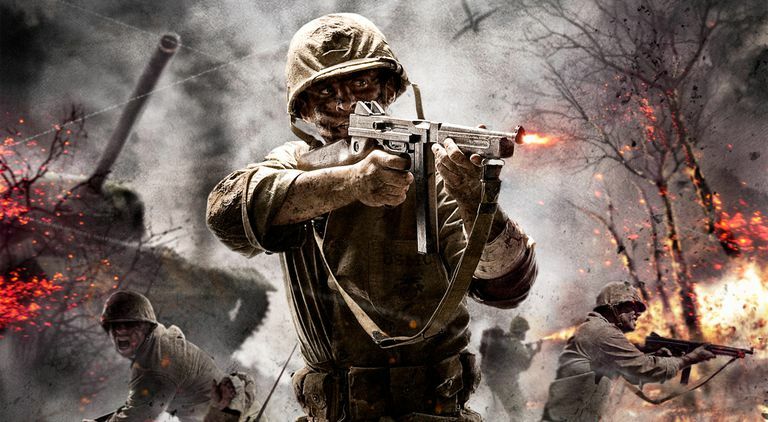 It's an addictive challenge that rounds out the most feature-packed COD game to date.